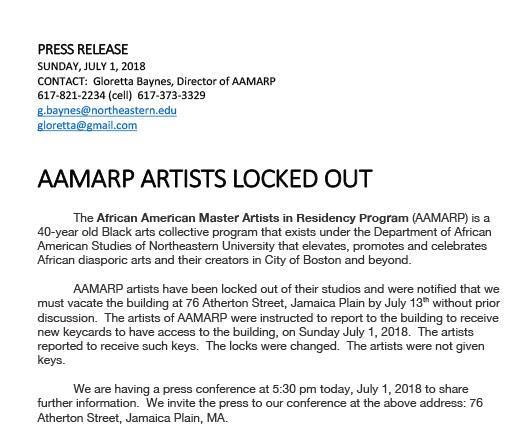 Artists involved in the African American Master Artists In Residence Program at Northeastern University charge that on Sunday the Boston school locked artists out of the building the four-decade program has long occupied in Jamaica Plain, and is trying to push the artists out of the place. Monday afternoon, I asked Nyul via email: Is there a timeline for when Northeastern plans to complete the repairs? And is Northeastern going to have AAMARP move back into the building after the building repairs are made? I’m awaiting a response. Help Wonderland keep producing our great coverage of local arts, cultures and activisms (and our great festivals) by contributing to Wonderland on Patreon. And sign up for our free, weekly newsletter so that you don’t miss any of our reporting. The African American Master Artists In Residence Program began with the artist, teacher and activist Dana Chandler. During the 1960s and ‘70s, he was known around Boston for his art celebrating black Americans and challenging racism. He also challenged the de facto white-artists-only segregation of Boston area museums like the Museum of Fine Arts, the Institute of Contemporary Art, and Brandeis’s Rose Art Museum. He pushed them to exhibit art by living African-American artists. When Chandler’s personal studio in Boston’s South End was ransacked and the building then burned in 1973, Northeastern came to his aid by bringing him in to be an artist-in-residence at the school’s new African American Studies program in return for teaching a course at the school. Chandler soon convinced Northeastern to give him larger space, in an old factory at 11 Leon St. in Roxbury that the school owned. He moved in in 1974 and turned it into a mammoth studio (around 32,000 square feet) and event space, hosting parties for the MFA and a conference of African American artists. The space was so large that in November 1978, Chandler and Northeastern opened the space up to other black artists as part of the launch of the African American Master Artists In Residence Program. Ten large studios were offered “to provide a living focus for the international third world and world community around the diverse dynamics of African-American aesthetics,” organizers said at the time. The initial roster of artists (not all of them occupied studios at Northeastern, as some preferred to keep the studios they already had) included Ellen Banks, Calvin Burnett, Dana Chandler, Milton (Johnson) Derr, Tyrone Geter, Arnold Hurley, Reggie Jackson, Stanley Pickney, James Reed, Rudolph Robinson, Barbara Ward, John Wilson, and Theresa Young. It was a landmark project in its recognition of black artists, in the amount of space offered, in the length of the residencies (three years to start, but many allowed to stay much longer; some current resident artists have been there decades), and it was “rent-free” (which continues to this day, artists say). “Thus enabling the artists to produce works at a level of intensity none has ever been able to attain,” organizers wrote in the late 1970s. Chandler served as the director until the 1990s. Amid budget cuts, “in 1991, they pushed my amount of time to work as director to one day a week and in 1993 they fired me,” Chandler tells me. He says he maintained a studio there until 2004, when he relocated from Boston to New Mexico. Over the years, the program moved from Leon Street to a Huntington Avenue building, then back to Leon Street, and in recent years at 76 Atherton St.
After receiving the June 28 letter from Cimilluca, artists participating in the African American Master Artists In Residence Program were under the impression that they could come to the building Sunday morning to get new keys. School officials, Frazier says, “did not suggest we could return” after the building renovations or offer an alternative location for the studios. About a dozen artists in the program have studios on the four-story building’s two top floors. The building is also home to additional studios, not part of the program, and storage for the school’s campus bookshop, artists say. “The fact that they have not advised any other occupants of the building to vacate helps me understand that we are being targeted,” Frazier says. “The thing that still hangs over our head is the July 13 eviction notice,” West says.